At Cohn Insurance Agency, we work hard to meet all of your insurance needs. We search to find the best insurance coverage for the best available price. We have served Bandera, Texas, and surrounding counties for over 30 years. We also have customers in many other Texas cities and counties and would love to add you to our list of customers. 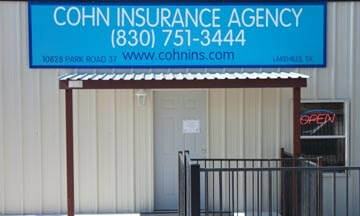 Cohn Insurance Agency is a family-run business in Lakehills, TX. Our job is to evaluate your insurance risks and give you advice on what products and companies can cover those risks for the best price. Our experience makes us able to take the guesswork out of finding the right coverage for you. Our personal and honest approach reflects our deep commitment to serving your best interests. We offer our customers a personal touch and the convenience of on-line resources, whether it is insurance for your automobile (commercial, personal, antiques), business, boat, RV, ATV, motorcycle, homeowner, life, health, liability, farm, ranch, flood, etc., we have a policy that is designed and priced exclusively for you. If you are a business, we provide insurance that protects your company, so you can get back to business. We can also help you recover from the unexpected. We value each person we come in contact with, whether they have a lot of assets or a few assets. Unlike an agent that works solely for a big insurance company, an independent agent has more resources available to help you. The more resources available, the more likely you are to save hundreds of dollars on your insurance. As a home and auto insurance expert, we can save you money by showing you dozens of policies from different companies. We’ll work with you to get insurance that fits your budget and your needs. We’ll do the leg work for you and bring you the best rates we find. On top of that, we’ll never try to sell you any insurance you don’t need. And unlike the online insurance providers, we’ll actually give you personalized attention and help you whenever you have questions or concerns.